Love Mine – great for home and Studio – I add a JBL D130 (original) in an early Bandmaster sized 2-12″ enclosure 10X20X30 closed back with a cross over to a hi-freq driver installed in it and the combo does superb with my Pedal Steel, Lap Steels and Guitars. Would consider owning a backup. I have one and gig with it. This amp really got a bad rap. It is not a living room amp. It needs to be played at live-gig volumes so the power tubes are put to work. It doesn’t sound good until its really pushed; you need the room size and air-volume for this amp to really come into its own. It actually sounds like crap in my living room–a definite Jeckel & Hyde thing going on. The clean channel sounds great–nice and chimey, a classic Fender sound. Overdrive channel is nice on a Fender amp; I re-tubed the gain stage with a 5751 and it really gave the channel more clarity and definition. Like all tube amps, you can really fine-tune the tone with a retube. Fender isn’t a tube manufacturer and they go to the same marketplace to tube their amps. On the “con” side–it is heavy. I hate lugging it around. Also, tube changes are difficult due to the layout of the chassis and the fact that the tube sockets are attached directly to the circuit board under the chassis deck. Also, at 1/4 power, the tremolo circuit is under-powered and is barely noticable. All in all, this is a great gig gin amp. channel switching. maybe my concert and champ will finally be retired after about 20 years or so of use. I have this amp and the reverb is making a lot of noise. I want to change the 2 tubes for the reverb/vibrato but I don’t know which ones they are. Can you help? The reverb driver is a 12AT7. On the tube chart inside your amp its number V7. All other preamp tubes on this amp are 12AX7’s so it’s not tough to find it. I have a 2002 pro reverb reissue. I think this is a great amp. It’s a beast of an amp to carry around but aside from that, it’s a great amp. I’m having a problem with it now and it has me scratching my head. I was using the amp a couple of weeks ago and all of a sudden….no output! I took out the tubes and had them tested. One was completely gone and two more were weak. I replaced the three of them. They were 3 of the 12AX7’s. I thought for sure that I had the problem solved. Brought the tubes home, installed them….same issue was present. I say that there’s no output but I think it’s more of an input problem. When I tap on the tubes, I can hear the taping noise coming through the speaker. Also when I flick the output switch to full, I can hear a small hiss in the speaker get louder. Any suggestions as to what the problem might be would be greatly appreciated! the cleans are fat snappy and warm with clear definition. Plenty of power even at the 12 watt setting which I use most of the time. I use it in the studio as well a bar and out door festival gigs. When im out doors I put it to full volume. the reverb is noisy when its above 4 and hums quite badly at 7 or 8 to the point its gets unusable. I only use the verb a 1 or 2 so I have no issues.. From what I read on the net theres an inherit problem with the verb circuit. No tech I found was able to correct it but you can tame it with a lower power tube in the verb socket. its a great amp very heavy but the tone out weighs any negatives. the head it improves with a speaker change but im still using the stock Jensen and I have no need to change anything. I am looking to sell my pro reverb, its in perfect condition and sounds incredible. As there are so few around, I am having trouble working out what an appropriate price is for this model, can anyone give me an idea? I am in south London if anyone wants to give me a good price and is interested? Still looking to sell it Leo? I’m in Surrey and would be keen to buy. I have had one for about 10 years, fabulous amp but heavy, I also have ’65 DRRI, the Pro is a far better amp in all areas except the weight. Never liked the overdrive sound on Fender master volume amps but this one is good and very usable, it has an effects loop, extension speaker out and 1/4 power switch, very versatile by far the best Fender I have had, the sound is amazing and loud. Unfortunately it is just too heavy for me these day, just lugged it up and down stairs at gig and have decided it’s time to sell it and use my Trademark 60 for gigging along with the DRRI for smaller rooms. Looking at a Roland Bluescube as well – and use the Trademark as a slave for outside gigs. 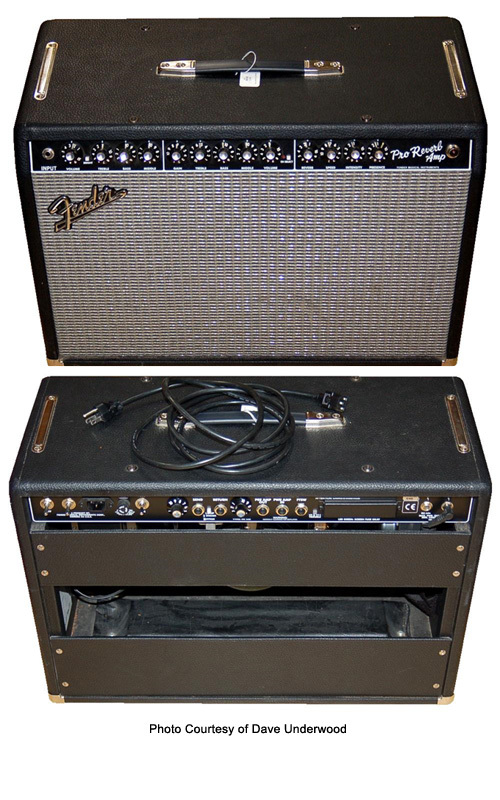 This might help…The Fender Pro Reverb is a high-end guitar amplifier made by Fender. It was in production from 1965 and was discontinued in 1982. The Pro Reverb is a 40-watt tube amplifier and has a pair of 12″ speakers; however, models later than 1976 were increased to 70 watts. Teagle and Sprung, authors of the definitive book on Fender amplifiers (Fender Amps: The First Fifty Years) described the Blackface Pro Reverb as the best amplifier ever produced likely due to its combination of the two twelve inch speakers, its high quality reverb and tremolo, and just the right amount of power to get either classic Blackface Fender cleans or natural tube breakup at reasonable volumes. They wrote, “the author recommends these amps as the best all-around amp ever made—by anyone”. The Pro Reverb is most often used by players seeking a traditional Fender clean tone, with, owing to the relative low output power, propensity for ‘breakup,’ or musically-pleasing distortion. Many players note the quality of the tube driven spring reverb and tremolo (inaccurately referred to as “vibrato” by Fender). At a time when Fender was increasing the wattage of most of its tube amps in an attempt to provide players with cleaner tones at higher volumes, the Pro Reverb was somewhat unique in the Fender lineup due to its relatively low power output (prized by today’s players) and smaller output transformer, which gave the Pro Reverb a “dirtier” sound than most of its contemporaries. Because of this, at the time the Pro Reverb did not find the widespread popularity of amplifiers such as the Fender Twin, but in recent years it has seen a revival and has become highly sought after due to its rarity and excellent tonal characteristics. The original Pro Reverbs are “blackface”—they have black control panels with white lettering, script logo, silver/black/white grille cloths, raised Fender logo on the grille cloth and black Tolex covering. They use two 5881/6L6GC power tubes, a GZ34 tube rectifier and are rated at roughly 40 watts. They have two channels, one of which has reverb and tremolo. A dual footswitch controls the effects. In excellent condition, with original speakers these amps were selling between $1900 and $2400 in 2010 (2011 Vintage Guitar Price Guide). Mint examples usually sell for more. I just saw one used one at Guitar Center (Atlanta, GA) listed for $799.00 and price reduced to $699.00. I have been trying to find out more about this amp. Please let me know if you found others listed and what they were selling for. Craig, I had the same problem. Changed tubes and everything. Ended up being a dirty switch. The white pushbutton switch on the back between the loop input and output. All I did was kept pushing it to clean it. Everything is fine now. A dirty switch can cause a lot of problems. I’m sure you have it fixed by now. But, something to check periodically. Did anyone ever solve the noise problem in the reverb circuit? Just picked up a 1999 Pro Reverb from the fine folks at Wildwood Guitars in Colorado – via Reverb.com site. It arrived just yesterday, but sadly the 4 button footswitch was not included or available. Does anyone know where I could purchase this footswitch or an acceptable replacement? I’ve emailed Fender just a few hours ago, but thought I would check in here. Love the sound – it is wonderful. Not sure why Fender would have the footswitch as the only way to activate the Tremolo, that seems shortsighted!